I fell in LOVE with her after first saw her on youtube. Kudos to Ronnie for sharing info with me about her. She's pretty, talented and makes me feel small. This is what i felt when i feel something inside with someone but who ami i? I'm just an ordinary guy. I really wish one day we can share stage together and play our music.. wow..what a dream from a man like me.. Her full name is Prisa Adinda Arini Rianzi. She was borned on 6th January 1988 in Indonesia. Yeah she's Indonesian. She already released a video clip on September 2007. She also joined a few group like Zala and Vendetta from Indonesia. She's a singer under the label Aquarius Musikindo. 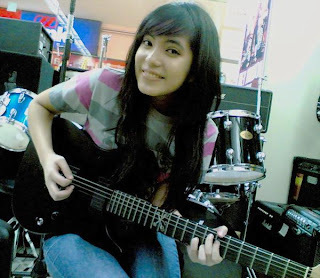 She's a multi-talented artist with which she capable handling guitar, piano and other musical instrument.